Have you visited Jill at Lift Your Sole lately?? Her website has been revamped and the new products are AMAZING. Go Shop HERE, you will be glad you did!! She was kind enough to send me her 26.2 Believe T-shirt, I am in LOVE with this shirt, pictures soon... I also received an amazing necklace for my birthday from Marlene, she bought the charm from Lift Your Sole, the charm simply read "BELIEVE." This necklace makes me feel complete, thank you Marlene. This shirt got me thinking. The word BELIEVE has been eve present in my life. My belief in myself, a higher power, love, fate, you name it. I know that everything happens for a reason and I WORK to make sure that things happen the way I BELIEVE they should. Self-doubt does not do us any good. Imagine if you were never taught doubt, you were brought up to BELIEVE that you can do anything, be anything. How different would life be? Unfortunately society puts us in little boxes, making it difficult to ever truly reach our full potential. Confidence is called arrogance. Success is often tagged as selfishness. What a PAIN!!! My thoughts? I say BELIEVE!! You have something you want to go for, go with all your heart, BELIEVE in yourself and watch as others will BELIEVE in you too. I believe hurdles in life are meant to be jumped over, not as something to stop us. What you believe has more power than what you wish, hope or desire for. You become what you believe. Write it on your hand if you have to (ala Marlene) but please BELIEVE!! Whether you aiming to run 1/2 mile or Marathon, trying to lose weight, going for a career change, hoping to find love, fighting an illness, whatever it is.... BELIEVE!!! I agree 100%! I have a "believe" necklace too! oh I like your post today its so empowering!!! Love the shirt it's so fun. I love this one: If you are going to doubt something, doubt your limits. Love the inspiration, and L*O*V*E the shirt!!! Love, love, love this! And the shirt. Thanks for the inspiration! My very favorite quote is "Don't just chase your dreams, RUN them down!" I try to think about that every time I pound the pavement (or the dreadmill). What a fantastic shirt! Love the quotes!! Great post, Mel. You're going to make an awesome coach! Love love love it! So happy you liked the necklace. I thought it was apropriate since you inspired me so much by constantly telling me to BELIEVE before my sub-4 marathon! I was so inspired every time I looked down at my hand and I will definitely do that again for a big race! P.S. AWESOME shirt too! Jill rocks! Love it! And YES I will be pulling out the old sharpie on 10/10/10 and write BELIEVE on my hand!! What a great post today. I printed it and put it on my fridge. Believe is going to be my mantra for the next 10 weeks of training! btw, I got my Scape today! Thank you! Just in time for my Boilermaker 15k on Sunday!!! Love the shirt! and I love the idea of writing something positive on your hand! too cool! How did you know that I needed this post today. Thank you!! Believe is the key word of my most favorite charitable organization http://jakesfoundation.org. 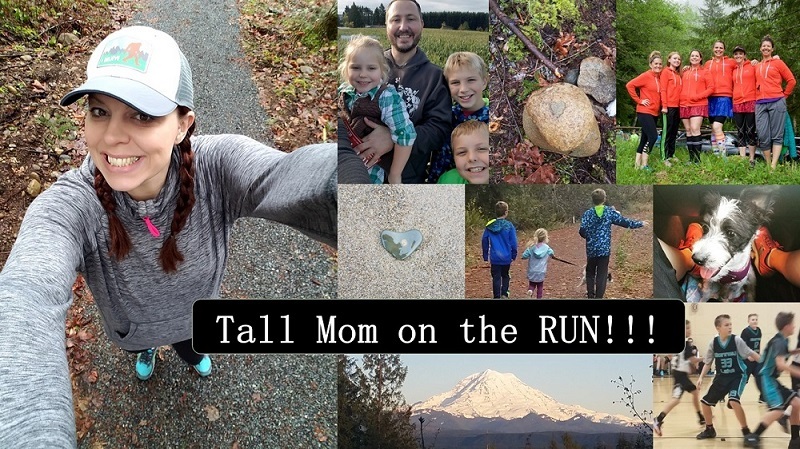 Great post Mel - I love the idea of writing something positive on your hand and will be trying this for my 1/2 marathon in August and just maybe for the MS 150 bike ride. check out my most recent post. I got something in the mail today!!!!!!! Yes! 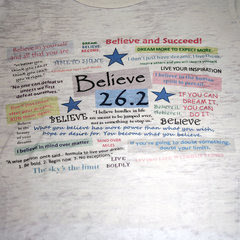 "Believe It" is my mantra for 2010! Thank you so much for this post! I woke up this morning dealing with some things and read this and feel renewed! This was exactly what I needed! Thanks! nice post. if you don't believe it will never happen!